During Chompoo Araya A. Hargate (อารยา อัลเบอร์ต้า ฮาร์เก็ต)'s recent visit to Paris, France as Bel Perfume's spokesperson, the actress visited the beautiful Château de Chantilly on May 31, 2013. 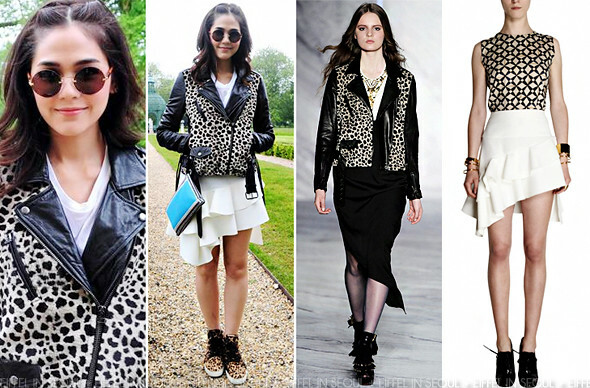 She wore a leopard print leather jacket from 3.1 Phillip Lim Fall/Winter 2010 collection with a plain white tank and asymmetric layered ruffle skirt from Balenciaga Spring/Summer 2013 collection. Mary Katrantzou clutch and Christian Louboutin leopard print sneakers to match her outerwear. I am not a fan of leopard prints but I do love her get-up.